There are currently 115,068 users on this website. 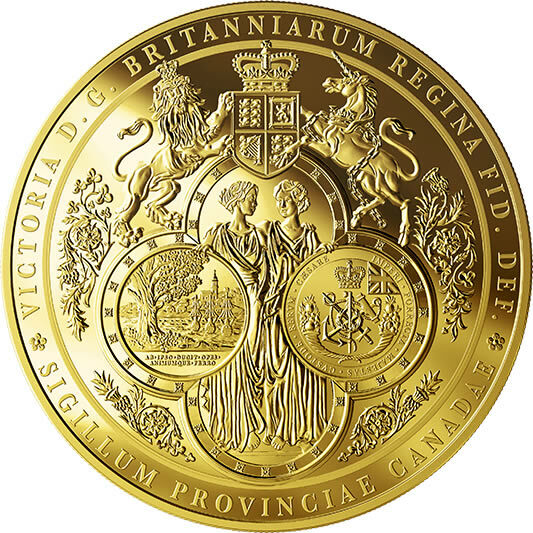 Royal Canadian Mint - Your coin features the Great Seal of the Province of Canada from 1841, redrawn for use on a Royal Canadian Mint 101.6-millimetre, one-kilogram 99.99% pure gold coin. The image features all of the elements of the original seal, including the seals of the colonies of Upper and Lower Canada held side-by-side by two allegorical female figures representing the united colonies. The coat of arms of Queen Victoria sits at the top of the image, which also features engravings framing the images and decorative floral engravings. The outer rim includes the Latin text from the original seal: "VICTORIA D.G. BRITANNIARUM REGINA FID. DEF." and "SIGILLUM PROVINCIAE CANADAE." The obverse features the effigy of Her Majesty Queen Elizabeth II by Susanna Blunt.